As people continue to age, many tasks that used to be very easy can become more challenging. One part of the home that can be harder to use safely is the bathroom. Due to slippery floors and large steps taken to get into a standard bathtub, there are a variety of hazards that come with a standard bathroom. Fortunately, there are a variety of tips that anyone can follow which could help to convert a traditional bathroom into one that is safer for seniors. One of the best investments you could make in a bathroom for a senior citizen would be to invest in a walk in tub. With a walk in tub, you will be able to easily walk through a small passageway that is basically at floor level. This will then give you access to a bathtub that is large and has plenty of space, includes a proper bath fitter, and even has guardrails. If you have a shower in your bathroom, you should consider a full shower conversion to make it more accessible for a senior citizen. There are a variety of features that you can include in your shower that can make it much easier and safer for someone to use. Some great additions and improvements to make for your shower can include adding grab bars and rails, which could help to prevent a fall, having a lower shower head sprayer attachment, and making the entry point more accessible. While a good bath fitter for a bathtub can help to prevent slipping, you can also drastically reduce the risk of a slip and fall by placing down rugs and mats that are slip resistant. One of the biggest issues that comes with a bathroom is slipping and falling. With senior citizens, you should try to have as much of the flooring covered by slip-resistant rugs and carpets as possible. This will help to prevent a bad accident. For additional support, you should look for rugs that are soft and supportive. Finally, you may want to consider replacing the toilet with one that is higher. For a typical senior citizen, you should have a toilet installed that will require only a minimal amount of squatting. This will make it much easier for a senior to stand up and after they are done using the washroom, which could also prevent falls. 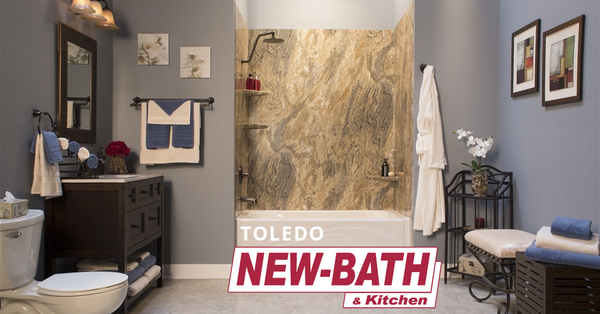 When you are in need of a bathroom remodel, Toledo residents should call a Toledo New Bath to handle their remodeling needs. We are able to work with you to develop a remodel plan will leave you with a functional, safe bathroom while also staying within your budget. Learn more about our 1-Day Installation.